Blended by perfume experts, Comfort Creations Cherryblossom & Sweetpea contains fantastic fragrances made to delight your senses. Each washes locks in an invigorating scent, giving you 100% more fragrance in every drop (Versus Comfort Pure). Use alongside laundry detergent in every washes to give clothes super softness and lasting freshness. Works wonders on fabric fibres making them quicker to dry and perfect for easy ironing. Helps maintain colour and shine to help clothes stay looking their best for longer. One of a range of outstanding fragrances in the Comfort Creations family. Invigorate your washing with Comfort Creations Cherry blossom & Sweet pea 33 Wash 1.16 L. With a fresh blend of soft cherry blossom and sweet pea handpicked by perfume experts, it provides you with 100% more long-lasting fragrance in every drop. With every wash, Comfort Creations fabric softeners lock in lasting freshness and refreshing fragrance. And they also add super softness to all your clothes. Use our fabric conditioners regularly and they work wonders, promoting faster drying and easy ironing. How to use: Pour a 35ml dose straight into the correct compartment of your washing machine drawer along with your favourite laundry detergent for lasting freshness. Do not pour directly on to fabrics. Choose the right wash setting and let your machine take care of the rest, as it releases the Waterlily & Lime fabric softener during the final rinse cycle. Use Comfort in every washes to maintain garment colour and keep your family's clothes looking and feeling soft. 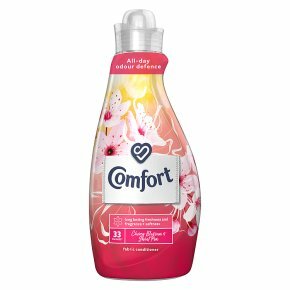 Comfort Creations Cherry blossom & Sweet pea 33 Wash 1.16L will revitalise your washing, giving your clothes a crisp, clean fragrance that lasts all day. You can also enjoy other outstanding Comfort Creations fragrances including Honeysuckle & Sandalwood and Tuberose & Vanilla Flower. Use alongside your clothes detergent for best results.